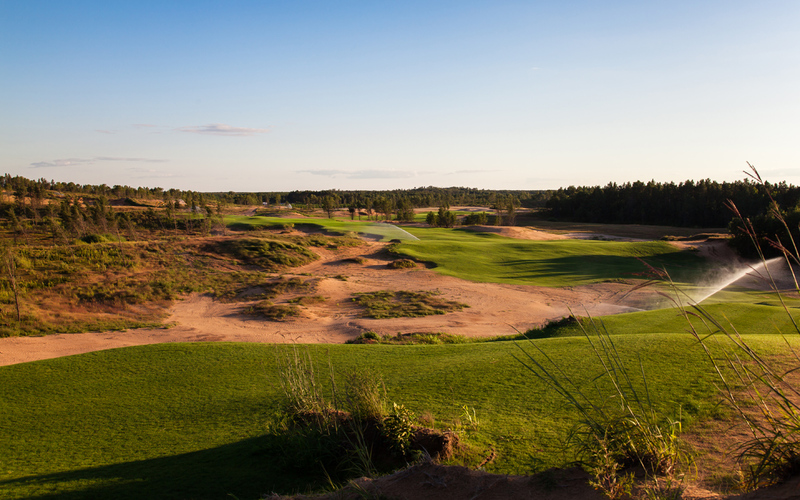 The first hole at Sand Valley provides an inviting introduction of the adventure ahead. You can debate whether Wisconsin needs more premier golf. What is not open to discussion: Sand Valley, an ambitious new project 3-1/2 hours north of Chicago, has a chance to become the Bandon Dunes of the Midwest. People are going to travel to Sand Valley from around the country, and be glad they did. It’s terrific, beautiful and fun golf for all skill levels. There are no heroic, but ridiculous forced carries. The bunkering and tall grass are in play, but fair. There’s some marshy stuff. But if there was a true water hazard, it doesn’t come to mind. The first Sand Valley course is about terrain. Natural terrain. It’s a project by Mike Keiser, who built Bandon and a host of other irresistible golf properties around the globe. Their common thread: Keiser’s projects take ground that’s perfectly suited for golf, and turn it into the kind of golf that harkens back to the roots of golf. Like Bandon Dunes, Sand Valley is a walking-only experience. 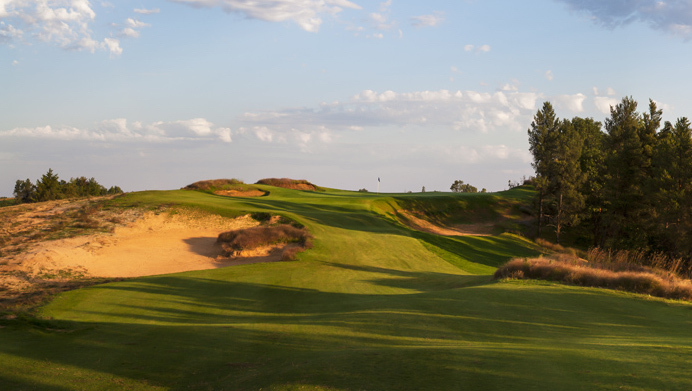 And like Bandon, Sand Valley is a layout that specializes in engaging holes that take advantage of fast-and-firm conditions. The appeal is similar to why I like Scotland and Ireland. You can argue about whether a golf layout built on a former tree nursery in central Wisconsin can be considered links golf. But if it has that kind of feel, does it really matter? Back to the original question: Does Wisconsin really need more premier golf? It already has the four-course Whistling Straits/Blackwolf Run extravaganza, which has hosted PGAs and women’s U.S. Opens, and will soon add the 2020 Ryder Cup, In June, Erin Hills will host the 2017 U.S. Open; The Badger State also has myriad other golf destinations in Lake Geneva, Green Lake and even the Dells—all thrown into a short season. Add a renovated Sentry World in Stevens Point, and some quality public courses in Milwaukee (Brown Deer) and Madison (University Ridge), and the Wisconsin golf hits just keep coming. The answer apparently is that quality loves company. Despite its short season, Wisconsin golf only seems to benefit from the irresistible new golf destinations that keep populating the state. While Sand Valley isn’t all that remote, it sure feels that way a you get near to it. That’s what I was thinking when the GPS led me onto a sandy, rutted road that seemingly went to nowhere. Incredibly, I encountered an elderly man walking along the side of this reddish bumpy road. “Is this really the way to Sand Valley?’’ I said. Sure enough, popping out of the forest was a dunesy, Emerald City of fairways and greens. Sand Valley was the gracious host of the 2016 Writer’s Cup, a mini-Ryder Cup contested by media (and talented quasi-media) from the great states of Illinois and Wisconsin. Near the end of the 2016 season, Sand Valley was very much a work in progress. There is some luxurious golf-centric lodging, with more on the way. And there is a well-appointed snack bar that sits atop the Volcano, a hill overlooking the first Sand Valley course. The Volcano offers a grand vista of the first, 10th and 18th holes. After a soft opening at the end of the 2016 season, this design by Ben Crenshaw/Bill Coore, who built Bandon Trails, will be fully ready to roll in 2017. Greens fees range from $85 to $195 for resort guests to $95 to $235 for others. Comfortable condos and villas are being built around the property, which is remote at this point but likely to attract more off-site lodging. A second course, the work of Bandon Dunes architect David McLay Kidd, is slated to open in 2018. From there, there could be a third, and a fourth—depending on how things go. “We’re just going to keep building until we run out of money,’’ Mike Keiser Jr. told me with a broad grin. The uphill shot to the par-five fifth green is open for long hitters’ business. Given all the gloom and doom surrounding golf’s declining appeal, it’s notable that a trademark of Keiser projects is the walking-only experience. Bandon was one of the first public golf facilities to emphasize walking. It works at Bandon. I’m guessing it will work at Sand Valley, too. One advantage Sand Valley has over Bandon is that’s relatively close to population centers such as Chicago, Milwaukee and Minneapolis-St. Paul. That hasn’t kept golfers from getting there. And that’s not an issue at Sand Valley, which isn’t as remote as it seems. The project will be increasingly golfer-friendly moving forward, with a second course coming on board and with more lodging and amenities also being added. As I mentioned, Coore and Crenshaw have designed a course that’s challenging but is not necessarily about length. The tips stretch out to 6,901 yards, but the 6,060-yard middle-tee course provided an enjoyable experience for the single-digit guys in our group as well as the bogey golfers. No. 1, which is only 358 yards from the tips and 299 from the middle course, a great starting hole with a sprawling view of the golf course. It allows choices. A driver over the left-side hazards will leave a short approach. Even a safe tee shot, which can be made with an iron or hybrid, is likely to leave a middle or short iron. No. 1 is all about the uphill shot to a large, undulating green. Many of the par-four and par-five greens are receptive to potentially errant shots that are able to bounce their way to good finishes. That’s because of natural banking around the greens, and because of the fast-and-firm conditions that a sandy course affords. This was especially true on the par-five 10th, where the back of the deep green contained a virtual hollow that allowed balls to drain close to a back-center pin. The par-threes on the first Sand Valley course are an especially interesting combination of whimsical and devilish. The large green of the par-three third hole sits on a sloped plateau where chipping and putting is tricky. The par-three eighth has a crow’s nest of a green, but is short enough to entice. No. 8 is a short—136 yards from the tips—one-shotter with a small and sloping crow’s-nest green. Balls hit short and left will kick onto the green. But short and right—and anywhere else off the green, for that matter—create big problems. The final par three, No. 17, is the longest of the one-shot holes. Even from the middle tees, it measures 196 yards—and a large, shaved mound is the principle obstacle to this blind shot to a sunken green. But again, thanks to the firm turf created by the sandy soil, low shots can run delightfully up and over the mound, or bank down to and through the slot to yet another green that contains surprising undulations. No. 18 is a challenging uphill par-five—an excellent finishing hole that rises up to the Volcano. While not overly long, the 18th features a series of fairway bunkers, including a pot bunker or two that must be avoided off the tee. 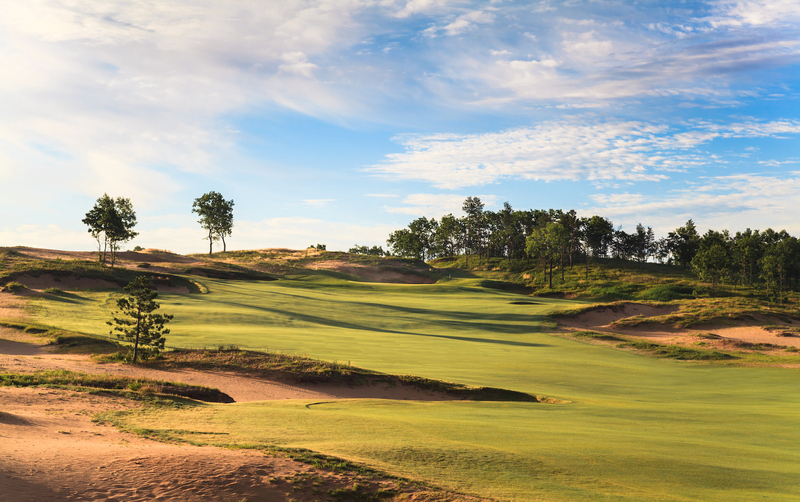 All in all, the first Sand Valley course ought to be a very popular anchor for what promises to be yet another major golf destination—in Wisconsin, of all places. We’ll keep wondering, “Why Wisconsin?’’ And we’ll keep teeing it up there.